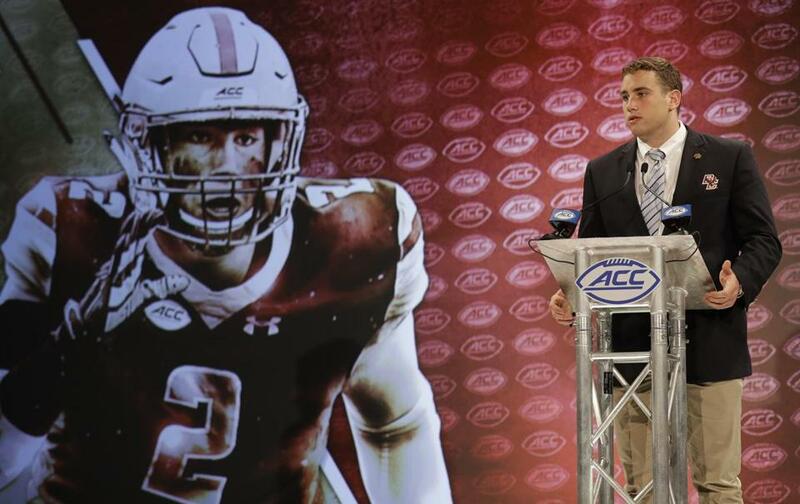 Boston College&apos;s Zach Allen answered questions during a news conference at the ACC Football Kickoff media day in Charlotte, N.C., on Thursday. The most important gift Boston College defensive end Zach Allen got in the offseason was a NutriBullet. When he took the step to retool his diet, the compact blender he got from his mom was the centerpiece. Allen had watched the changes that Harold Landry and Isaac Yiadom made to their eating habits as they went through the NFL combine process and decided to adopt them for himself. He mapped out goals for healthy eating and came up with meal plans and Allen stuck to them almost religiously. The routine could get redundant — chicken again! — but the results were undeniable. The Eagles will open up preseason camp in August and Allen will be their linchpin on defense. He became the anchor of the defensive line when injuries marred Landry’s senior season. He somehow flew under the radar a year ago, despite finishing second in the nation among defensive ends with 100 tackles. He was voted All-Atlantic Coast Conference honorable mention, which many in the Eagles locker room took as a snub. After back-to-back seven-win seasons capped by consecutive bowl appearances, the Eagles are positioned for a breakthrough. At the same time, Allen is poised to follow Landry’s footsteps as an NFL draft prospect. Looking for an added edge in an always competitive landscape, Allen saw nutrition as a way to maximize his performance. The logic behind eating better was simple: If you eat poorly, no amount of training will help. “You really can’t outwork a bad diet,” Allen said. With that in mind, he made his diet a part of the work. He sought out BC’s sports dietician Joan Buchbinder, who had experience with the Celtics, Patriots and the US Army Research Institute of Environment Medicine. They laid out when and what to eat, different combinations to break up monotony and tracked everything from carbs to grams of fat and sugar. “When I first met her [it] was sophomore year, I knew nutrition was important,” Allen said. “I got into it. But after a long day of class, stuff like that, you really don’t want to be eating the same bland old stuff, but now I’m really into it all the time. Spacing my meals. Last year, Allen suffered a shoulder injury against Notre Dame during the third week of the season. He played through it even though it required offseason surgery. In January, he had the procedure performed in New York at the Hospital For Special Surgery by Dr. David Altchek. The recovery took six months, but in that time he still found ways to train. Eventually, Allen started seeing results. The biggest sign of validation came when the Eagles were going through conditioning drills in the offseason. In the past, defensive ends are split between the slimmer ends and the bigger ends. The bigger ends would run with the heavier defensive tackles and Allen would dominate those runs. This year, however, the bigger ends ran with the slimmer ends. At first, Allen wasn’t sure if he’d be able to keep up with the times. There’s also the simple self-esteem boost. “You look in the mirror and look better,” he said. Eagles tight end Tommy Sweeney noticed. Allen went into the offseason with a clear idea of the expectations that both he and the team would carry. His answer was to control what he could and prepare.